Fossil fuel emissions are slowing, but CSIRO senior principal research scientist Pep Canadell and International Center for Climate and Global Change Research director Hanqin Tian say another major climate problem is becoming clear: food production. The greenhouse gas footprint of food is growing while the role of the food system in climate mitigation is not receiving the attention that it urgently needs. Just as humans pump greenhouse gases into the atmosphere, the land also produces and absorbs them. If the land absorbs more of a gas than it produces, we think of it as a “sink”. If it produces more than it absorbs, we call it a “source”. The ability of the land to absorb and produce greenhouse gases is affected by human activity. We wanted to know how human activities on the land are affecting these sinks and sources. Globally, the land currently absorbs more CO₂ than it produces (we don’t include fossil fuels in this), so it is considered a carbon sink. But we found that this is overwhelmed by production of methane and nitrous oxide, so overall the land is a source of greenhouse gases. This study highlights the importance of including all three major greenhouse gases in global and regional climate impact assessments, mitigation options and climate policy development. Another recent study calculated that the size of this combined greenhouse gas source is about equivalent to the total fossil fuel emissions of CO₂ in the 2000s. 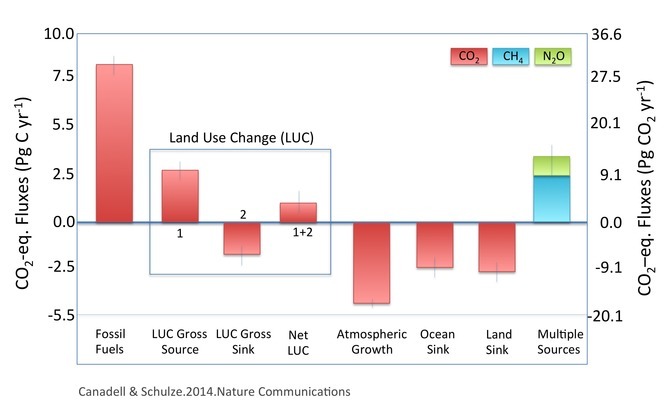 Looking at the chart below, if you add up the carbon emissions from the “LUC gross source” (emissions from deforestation) and the emissions from methane and nitrous oxide (in blue and green), then you can see they are roughly equivalent to those from the combustion of fossil fuels. So it’s a huge part of our contribution to climate change. 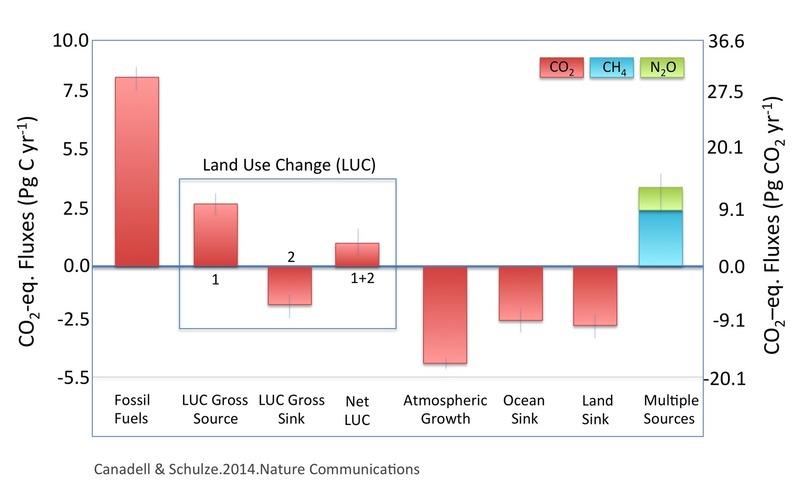 Importantly, CO₂ emissions from deforestation together with methane and nitrous oxide emissions are mainly associated with the process of making land available for food production and the growing of food in croplands and rangelands. Unfortunately, there has been limited discussion about major commitments to decarbonise the food production system, as there has been about decarbonising the energy system. Countries, particularly emerging and developing economies, have shown little interest in placing the food system at the forefront of climate negotiations. One reason is what’s at stake: feeding their people. A continuation of the current growth trends in methane and nitrous oxide emissions, at a time when growth of CO₂ fossil fuel emissions is slowing, constitutes a worrying trend. The greenhouse gas footprint of food is growing while the role of the food system in climate mitigation is not receiving the attention that it urgently needs. Opportunities for mitigation in this sector are plentiful, but they can only be realised with a concerted focus. Pep Canadell is CSIRO senior principal research scientist, and executive director of the Global Carbon Project, CSIRO and Hanqin Tian is director, International Center for Climate and Global Change Research, Auburn University. This article was originally published on The Conversation.